Just to wish everyone a happy Xmas. I recently brought a new CB500F AJ. Traded my Yam MT for it. Welcome to the forum. Got any Christmas pressies for the new bike? WOW!!! Somebody on here who can actually afford a new bike !!! @Beresford wrote: WOW!!! Somebody on here who can actually afford a new bike !!! I got a Puig screen, crash bungs, front & rear fender extenders for Xmas. Also when I got the bike they put on a centre stand, Datatool TrakKing and Datatag Security. I used some of my PPI refund towards the cost. I used to have a cb300R before the Yam MT, the one with the chocolate box engine which had a worldwide recall, so got shot of it. So far well pleased with the new cb500f although still running it in. Will put some pics up when we get some decent weather Also need to fit my tomtom 410 sat nav which I have had on my previous bikes, links through my iPhone and Cardo headset in my Shark Speed R skid lid. Just listern to directions and saves me taking eyes off the road to see map etc. I also belong to a local over 50's motorbike group, we have a meetup and chat in one of the locals and ride outs monthly. Nice friendly group. I got 500 squid off the price of a new one (£4,900), they are discounted at the mo as the dealers are getting the 2019 models in. Also got the most money for my trade in against other dealers. I agree Sky a really good deal, I did a search via fleabay and nearest to me for new bikes; I do have a more local dealer but stuck with a designated Honda only dealer. Not a multi franchised one. Welcome matey, hope you had a good Christmas too. @teamster1975 wrote: Welcome matey, hope you had a good Christmas too. Yes a good xmas thanks, hope yours was good as well. Blimey! That was a good deal. I only paid £125.00 less than that for my last brand new bike (a ZZ-R 600 ... in 1990). So much for inflation . Welcome by the way- and happy new year too. Yes Sky, still smiling and well pleased with the bike. Got a mobile call from Scorpion (Datatag Tracker}yesterday afternoon, I was installing my tom tom 410 sat nav and disconnected the battery to make final connections and they checked as it threw up a warning on their computer. Explained what I doing and said I would telephone them next time before disconnecting the battery. (At least the system works). I took off the tracker speed monitoring when I go out riding . Yes Sky, still smiling and well pleased with the bike. Got a mobile call from Scorpion (Datatag Tracker}yesterday afternoon, I was installing my tom tom 410 sat nav and disconnected the battery to make final connections and they checked as it threw up a warning on their computer. :oops: Explained what I doing and said I would telephone them next time before disconnecting the battery. (At least the system works). I took off the tracker speed monitoring when I go out riding :roll: . I'm not really sure I'd like this kind of tracker on my bike - mind you, mine isn't worth stealing! Which converts into a sum of some 8600£. Give or take a few quid. OldRocker, I trust you cherish your new bike just a little bit more now, eh? Yes Sky, still smiling and well pleased with the bike. Got a mobile call from Scorpion (Datatag Tracker}yesterday afternoon, I was installing my tom tom 410 sat nav and disconnected the battery to make final connections and they checked as it threw up a warning on their computer. Explained what I was doing and said I would telephone them next time before disconnecting the battery. (At least the system works). I took off the tracker speed monitoring when I go out riding . Do you also have to phone them before taking it out for a ride? No I don't have to tel them before taking it for a ride, only when I disconnect the battery or someone nicked it. I can also track the bike via my iPhone, laptop etc. The tracker came with the bike and a years subscription. Will decide whether I renew after that. 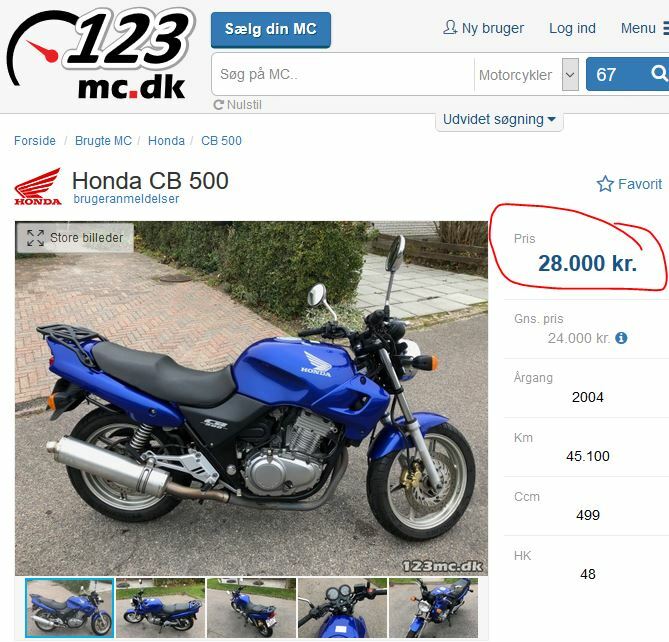 I know second hand & new bikes are expensive in Denmark I have friends who live in Odense and in Tjele. I used to have a 2002 cb500 with 11,000 miles on the clock and brought it for £1,450 (sold it for £1850). I also imported a 1997 cb400 four nc36 50th anniversary edition, water cooled with 4 seperate exhausts from Japan. Also a VT500c 1986 shaft driven cruiser from the USA and did it up and sold it on for £600 profit. I certainly wouldn't knock anyone with an older bike as we are all biker friends. My new CB500 F AJ cost me £4990 on the road including pdi & road tax etc. 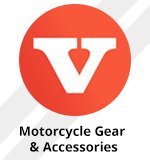 Your bike should be good for 100,000 miles as they have bullet proof engines if oil/filter/engine etc serviced correctly as per the manufacturer. Take care and ride safe mate. PS: It's nice to be pampered now and again. I also imported a 1997 cb400 four nc36 50th anniversary edition, water cooled with 4 seperate exhausts from Japan. Pampered: Yes. Wish I could make the missus understand that. Here in the UK the leasing arrangements are mostly over 3 years, then either pay off the balance, give it back or start again with a new bike/car. Not for me though as I prefer to own them and lucky enough to be able to afford to buy one outright (buying power and discounts). My cb400 NC36 has 53bhp and revs to 11,500 rpm tops out at 115mph which would loose your license if caught.